The Jester Musica Stucchi Venetian Masquerade Ball Mask is steeped in tradition and style. Echoing characteristics from a distant past, these masks were worn in medieval Venice, originally in disguise and latterly as a well-known character depicting theatrical comedy of the time. Men who wear the Jester take on the characteristics of a Carnival comedy character who originated in the Commedia dell’Arte in ancient Venice. The Jester is original ‘Made in Venice’. 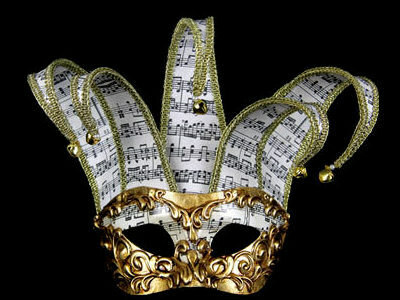 If for your special occasion masked ball your chosen costume must be authentic then the Jester Musica is for you. Carefully created by hand to an age old design the Jester Musica originates from a craftsman’s workshop in Venice. Tucked down little alleyways, these dedicated artisans create exquisite masks – some for the Carnival held every year in Venice and some for parties all over the world. You will see in the detailing the care the craftsman has taken as he assembled the quality materials to form this stunning mask. Every mask is unique, and that uniqueness of detail could be subtle, but it’s real nevertheless having been made by hand. Unlike masks made by machine or mass produced, no two are alike. 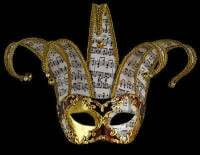 The painted-on music scores a base of papier mache make this mask especially different from other designs. It is sure to turn heads at your masquerade ball. This authentic character mask dates back to the 16th Century Carnival period. An annual event, Il Carnevale was held for centuries, lasting a little longer every year, such was the light heartedness of the celebrations. A popular choice for gentlemen then, it is well-liked too for today’s masquerade balls, especially for those who wish to impress. In a City loved for its surprises and mysteries, the Jester presents a prime example of traditional artistry. 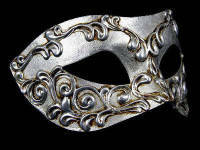 Wear the Jester Musica as an intrinsic part of your masquerade party costume. 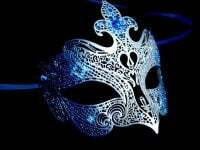 Order today and get this mask delivered free.